20130509_little_library, a set on Flickr. The first thing four-year-old Umayr Ansari does when he gets home after school is check his library. He gets so excited when he finds out someone has taken a book, his mother, Yasmin Fathaulla, told Doha News. 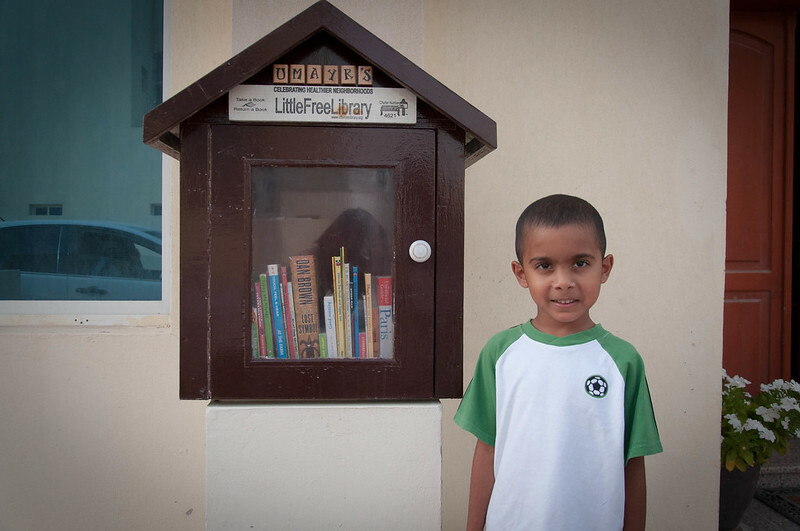 Located in Al Naqi Compound in Al Wakrah, Umayr’s Little Free Library is the first of its kind in Qatar, where a culture of reading is still developing. The “take a book, leave a book” library is part of an international movement of some 5,000 mini-libraries in 36 countries, including Ghana, the US and Pakistan, which were created to spread literacy and an appreciation for books. At 30 books, Umayr’s is not a big collection, but the library contains books for all ages. Everyone in the family is a reader, but there are few options to enjoy books in Qatar. Before Umayr started the library, he used to pass out books to kids in the neighborhood, his mother said. When she found information about the Little Free Library online, the family built their own from scratch. The website has instructions on how to build a library using recycled materials, Khalid Ansari, Umayr’s father, said.